Double Park annoys me !!!! Last weekend, I like many others seeking good bargain rush down to Shah Alam to check out the Harvey Norman warehouse sales. When we arrive, there were many cars and some already park really far away. So, hub and I were really glad we got a spot right in front of the warehouse. After browsing around for an hour or so, we left with just one paper shredder (for hub’s bro). The price was not really dirt cheap. In fact, a lot of it were the same price as the clearance sales which happen in Harvey Norman @ Ikano Power Centre (PJ) not too long ago. We left the warehouse hoping to ran off but to our dismay, we saw one car park perpendicular to us. Basically, there’s no way out. We look around his car for a number to call but nada. Pushing the car option (which is very popular inThailand) is not available either, since the owner put the handbrake up. It was after many Many MANY announcement from the DJ to find the owner that the idiot finally shows up! We were really angry with the owner and told him to leave his number in his windscreen or car in future. I could understand if you would want to double park. But, at least do it with care and be responsible. Leave us your contact number / at least inform the guard at the guardhouse where you are / how to reach you! OR, leave your handbrakes down and let us move your car a little so that we could be on our way. When we reverse out, that idiot when and park right in front of the warehouse gate. Bravo. Now, he blocks the only exit from that building. Sigh.. Why some people are so irresponsible baffles me? 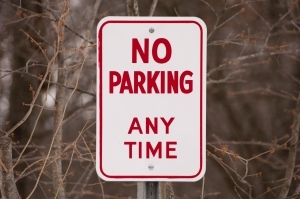 I wonder if I had this sign behind my car, will there be still people who will dare to double park behind me?! Seriously, with most of the people’s mentality and attitude, I don’t think they care either. Maybe next time, I should just ram my car out. I wish I could convince Harvey Norman to loan me their forklift!